I will be riding an [HP Velotechnik Streetmachine GTE (http://www.3ike.es/bicicletas/recumbent-bikes/hp-velotechnik/hp-velotechnik-streetmachine-gte) Recumbent Bicycle. Supplied by a good friend, Jason Elliot Harris at 3ike Recumbents in Madrid, Spain. These bikes are specifically designed for distance, comfort and for carrying all my worldly possessions on its back. The specification is more or less the same as my trike. But with the notable and obvious difference that it only has two wheels rather than three. I bought the bike just over a year ago now and have slowly been building it up. The finished bike, on a test ride north of Leeds. This last year, I have been tweaking and riding it to try to get used to the different riding technique. It's was a bit of a challenge getting used to riding this bike as it's a very different machine compared to all the bikes I've ridden previously. But once up to speed, its actually great fun. I haven't actually done along tour as yet so I'm hoping that next Spring I will be able to travel somewhere for a couple of weeks to get a feel of riding the bike whilst it's fully loaded. Even putting a single pannier on the back rack makes a difference to the way the bike handles and I'm sure that having a fully fitted tour bags on the back will make a bigger difference again. If you ever get the opportunity to ride recumbents one of the most immediate things you'll notice is the very widescreen panorama in front of you. Hence the 'See' in SeeBeast. The name is carrying on a theme. Also the metallic green colour gives it a slightly nautical theme. Update: This name actually never stuck and near Mazatlan in Mexico, I was asked by a guy if my bike had a name. I said no and he seemed upset by this.He said he had seen me riding along and that I seemed rather graceful gliding along. So he decided to call my bike 'La Gracia' Or Grace in English. Then in Santiago, Chile the frame cracked and the replacement became 'Grace too' after a Tragically Hip song I particularly like. Traditional bicycles, especially those that are orientated more at road riding and racing or Mountain biking tend to angle your head down to the road. So for the majority of your ride you tend to see the grey tarmac in front of you. Recumbents allows you to ride with your head at a much more natural and comfortable angle therefore you get to see the road in front of you and the scenery surrounding you. 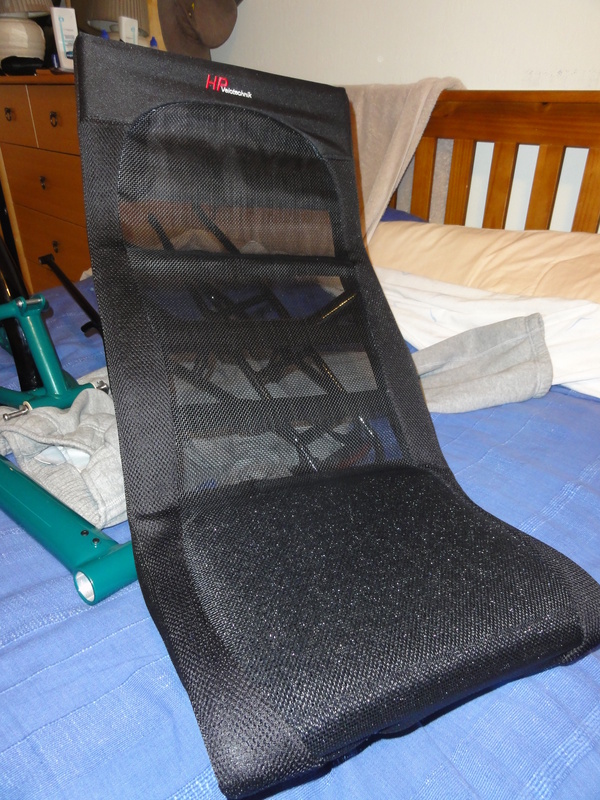 Of course, there is better support for the whole body because you're reclining back in a chair rather than sitting awkwardly on a very slim saddle. Personally I don't have a problem riding normal bikes except for occasional backpain and neck pain which comes with the passing of time, but has now been eliminated by riding a recumbent. 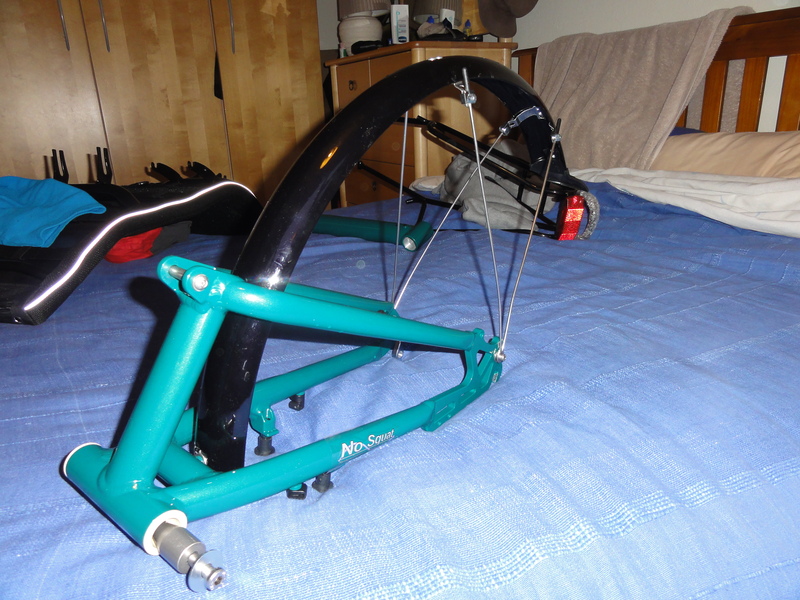 Another advantage of recumbent riding are the claimed aerodynamics of riding this type of bike. 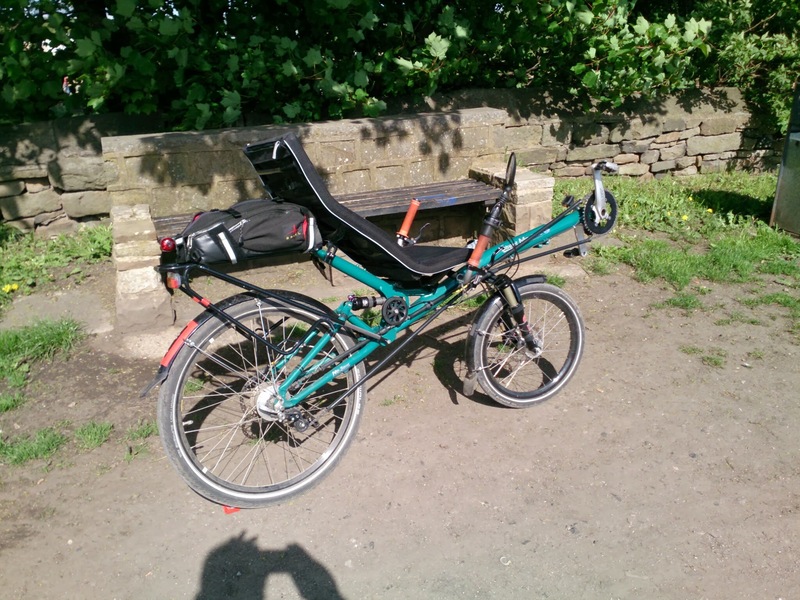 As you can see in this picture, borrowed from the Volae recumbents website. The rider on a normal bike tends to be in a very upright position for the majority of the time presenting a large silhouette and surface area to the oncoming wind. To achieve a more aerodynamic position he has to adopt a very low position which is very stressful on body. 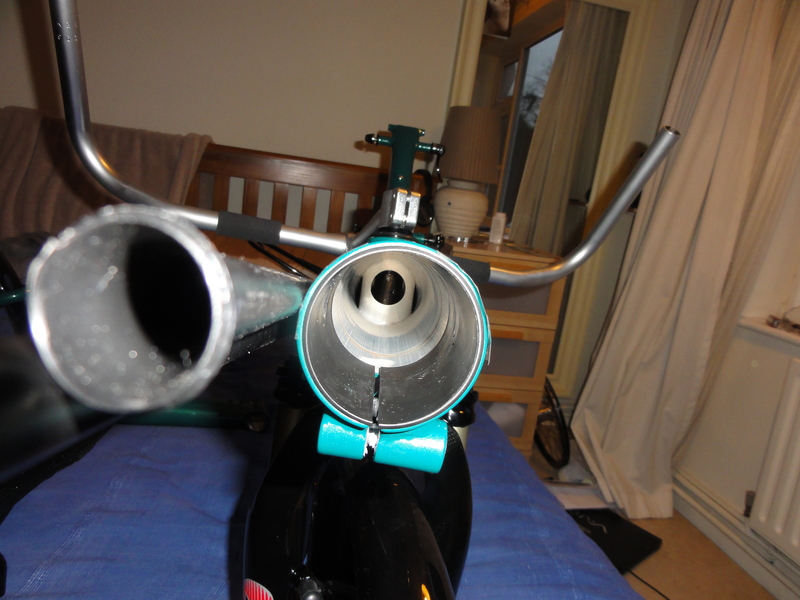 This aerodynamic position reduces the size of the surface area that wind has to contact in order to pass over the bike and the body therefore making it easier to travel forwards through the wind. 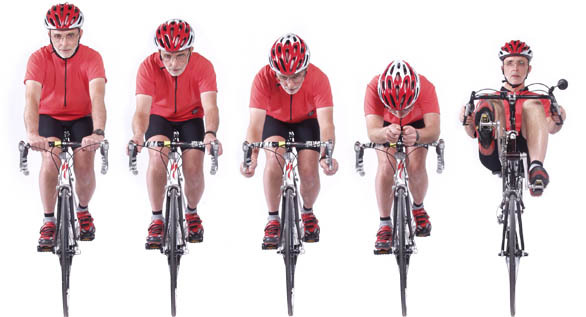 The longer you can maintain that position and more efficient your cycling will be. Even professional riders can't maintain this very low position for a long time without suffering. The recumbent cycling style puts the rider permanently in a more aerodynamic position whilst maintaining and supporting the comfort of the body. This can be held all day if necessary, with the minimal amount of stress that you would get riding a conventional bike. This doesn't make the bike easier to ride by any means, as a recumbent presents different challenges over the normal bike. They both have their advantages and disadvantages. And both perform differently in depending on circumstance. For me, a recumbent is ideally suited to this type of ride.